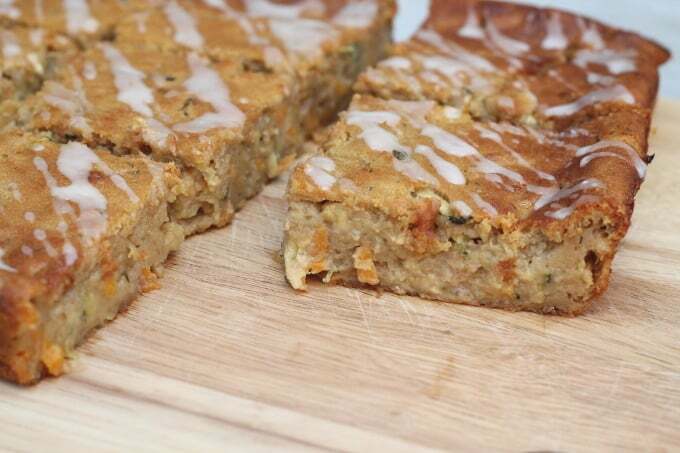 A delicious moist and dense Courgette, Carrot & Banana Cake with an Orange Icing Glaze. We all know what to do when faced with a fruit bowl of better than their best bananas. We make banana bread, right? But what about that veg that’s languishing at the bottom of the salad drawer in the fridge? Surely that deserves a bit of baking action too? This was the thought I had last week when clutching bananas, a carrot and a courgette that all needed to be used up asap. 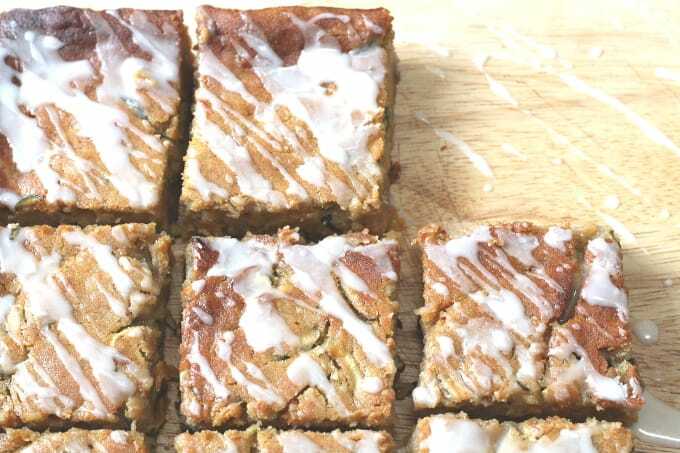 Not being very confident in my own baking ability I turned to the internet and discovered this recipe for Banana & Courgette Cake from Averie Bakes. I was a little nervous about including courgette in a cake but Averie’s looked pretty damn good so I decided to adapt her recipe to make my own courgette (or zucchini for those across the pond!) 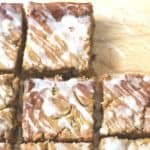 , carrot and banana cake with an orange icing glaze. I was really pleased with the results. The cake is very dense, more like a pudding cake than a light and airy sponge. 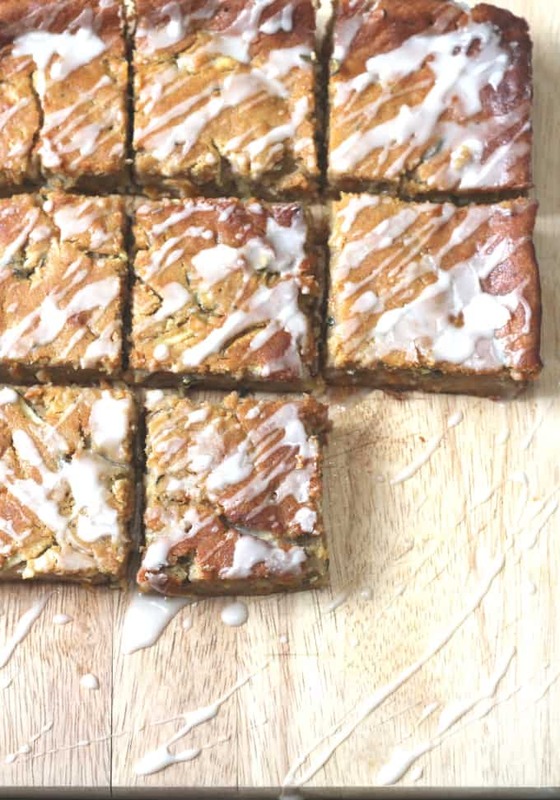 The courgettes contain a lot of moisture so no amount of baking will make this cake crumbly. But that’s the beauty of it, it’s moist and compact and wonderfully filling. If you aren’t a massive fan on courgette then don’t worry. The cake is definitely more banana than anything else. There is a subtle taste of carrot and to be honest I don’t think you would even know the courgette was there if you couldn’t see it. I grated the vegetables quite coarsely but you could also grate them more finely if you want to hide the presence of the carrots and courgettes from your fussy eaters! The original recipe used a butter glaze to finish off the cake but I decided to try to keep it a little healthier with a simple orange icing glaze. The cake can be stored in an airtight container for 3 days or in the refridgerator. I doubt it will last that long though. I don’t think it even reached 24 hours in our house! Preheat the oven to 180c / 350f. Line a 10×10 inch (or similar) dish with foil and spray with cooking spray. Melt the butter and add the sugar, egg, yoghurt and vanilla extract and whisk until combined. Add the bananas, carrot and courgette and stir until they have all incorporated into the mixture. Add the flour and baking powder and stir until just combined. Be sure not to over mix at this point. Pour the mixture into the baking dish and bake for approximately 40 minutes until the top is beginning to brown and the cake is set in the middle. Because this cake is so moist the usual ‘stick in the middle comes out clean’ test will not work here. Cooking time will depend on the moisture in your courgettes and bananas so I would suggest checking it from 35 minutes and allow longer to bake if necessary. Once cooked, remove from the oven and allow to cool in the baking dish for a few minutes. Once the foil is cool enough to touch, lift the foil from the dish and transfer the cake to a rack to cool further. Make the glaze by adding a little of the orange juice at a time to the icing sugar until it reaches your desired consistency. Once the cake has fully cooled drizzle the glaze on top and cut into 12 pieces. I’m trying to get my daughter to eat more vegetables, so I thought I’d give this a go. What better way to do it than to disguise them in cake! This cake was easy to make and is delicious. The orange glaze really is a nice touch. My only criticism is that I’m finding it hard to only eat one piece at a time! Lovely moist cake and can’t notice the courgette at all. You could certainly use gluten free flour but I’m not sure exactly what to use to replace the egg and greek yogurt to make it vegan, sorry! Yum! Thank you from Aotearoa. Mine turned out to be more of a dessert. I squeezed the water out of the courgette. I doubled the recipe as I had old bananas to use. I also halved the sugar. Excellent excellent! Looking forward to more recipes . Cheers, Paige. 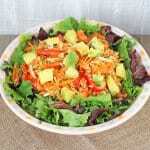 Hi Paige, glad you enjoyed the recipe! 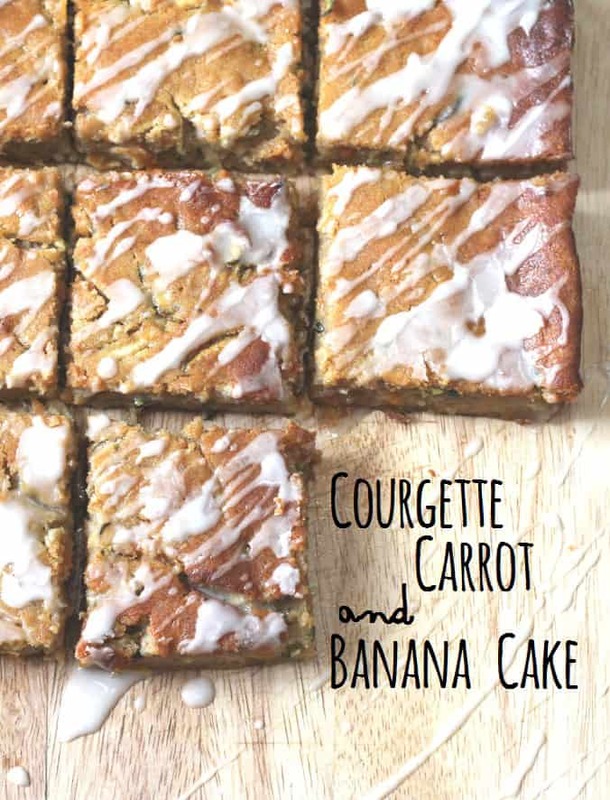 this looks great – I love banana bread, carrot cake & courgette cake but have never tried all 3 together! It really is good. You should definitely try it Helen! Love the pictures. I agree though, this cake looks so moist! I’m tempted… is it as good as carrot cake!? 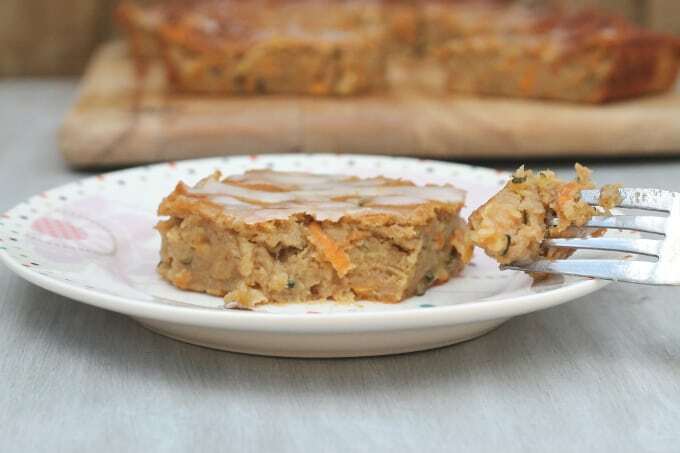 Its a bit different than normal carrot cake as the banana gives it a denser texture. But I like it just as much! This looks great! 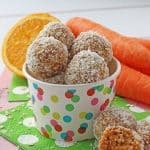 I still have never baked with carrots and courgette, so I am going to have to give it a try. Its really good Dannii. I think you’ll like it! It turned out great and I had no idea that a courgette and a zucchini were the same thing! 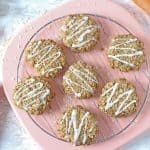 🙂 Thanks for trying my recipe! Yep they are the same. Don’t know why we have different names for the same vegetable! !